This dress just screams spring, the patterns are so bright and it's perfect for a lunch date. This silk dress was actually bought from my father in his last trip to China, so I can't really understand the brand on the label but to me it looks like a modernised chinese kimono dress. I paired it with black pumps and rose gold jewellery. 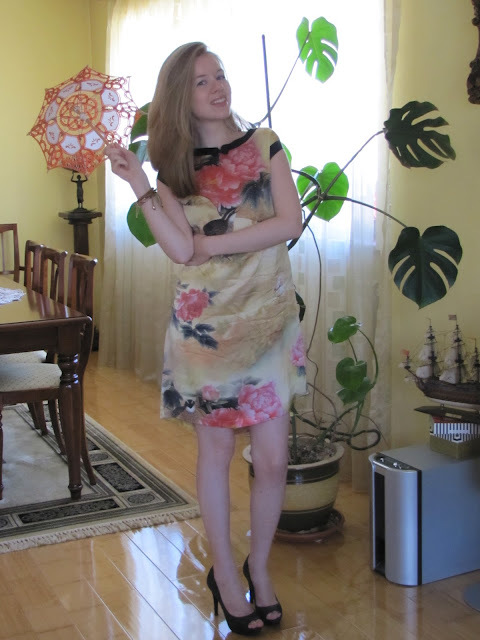 Since in Bucharest we had at least 15 degrees every day I could pull off wearing such a lovely dress and to be honest I'm kind of sad that the weather in Vienna is still so cold , since I hoped that till I will be back it would get a little warmer.